Check out the video tutorial of the Steam Workshop! 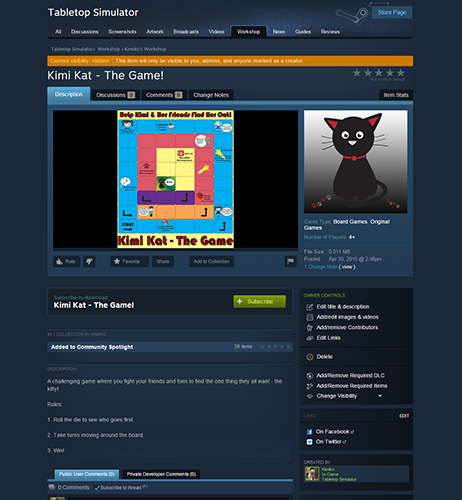 The Steam Workshop is an area where the community really gets involved, coming up with fantastic and creative ideas to share with everyone else. This is the place where you upload your games or download them for free. You can make your mods available to the public, for your friends only, or completely hidden where only you can see them. To upload your mod to the Workshop, click on UPLOAD -> WORKSHOP UPLOAD. Read through everything carefully and then input your details. When entering info in the description box, this is where you want to give the most information about your game. If it’s an original game you came up with, you want to give as much detail about it as possible. What are the rules? How do you win? All that good stuff. You can also use this section to give credit to those who helped you. Don’t worry, if you don’t fill this in now, you can edit it later. Just remember that the more detailed info you give, the more likely you’ll get people to subscribe, offer you feedback, and your mod could possibly be listed in our Spotlight in game. In the next section, you can either upload your files to an external site and input the URL in this box, or you can press the file folder icon for more options. This will bring up a file browser in which you can import images directly from your computer. Choose your image and either double click it or press the open button. You will get a popup box asking if you’d like to load it from your local disk or upload it to your Steam Cloud. In this case you want to choose the Cloud option since Local is intended for private use, meaning it’s not used in multiplayer. If you don’t put in an image for the thumbnail, you will get an error and the mod won’t upload, so don’t forget this step! Next, check mark the game type for your mod. Is your mod full of custom models that you created from scratch? Then you want to check that box. Is your mod a board game, but also a role-playing game? Then check both of those. And finally, you choose how many people can play your game. If it’s for more than 4 players, then only check that box. If it’s strictly a single player game, then only check the 1 box. Basically, don’t check every single checkbox for every game type and number of players if it doesn’t apply to you. 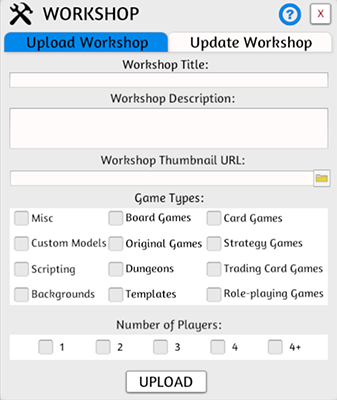 We want to keep the Workshop clean and make it as easy as possible for people to find the games they are looking for. Click the UPLOAD button and your mod will be uploaded anywhere from 10 seconds to a minute. By default, mods are uploaded as hidden, so only you are able to see your mods. This gives you a chance to verify everything is correct and make any changes necessary. 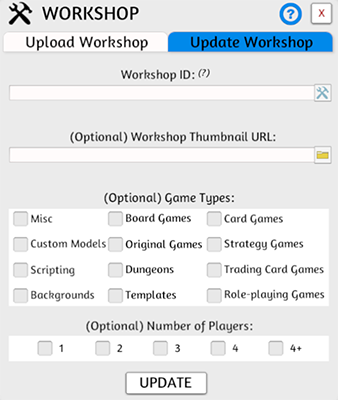 You will also get a pop up with your 9 digit Workshop ID when your mod was uploaded successfully. If you missed it, just look for your mod in your profile, the digits are found in the URL of your mod. You will need this when you want to update your mod. Adjust everything in your game how you’d like, including any new items you may have added. 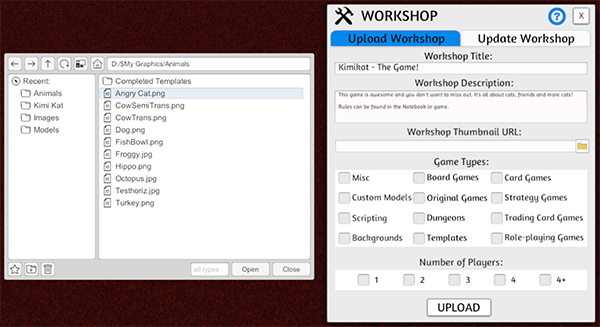 Then click UPLOAD -> WORKSHOP UPLOAD and then choose the Update Workshop tab. Click the icon next to the Workshop ID input box to quickly browse your mods and decide which one you’d like to update. In order for your mod to show in the list, you must be subscribed to it. If you need to change the thumbnail URL or any of the tags, you can do so now, but those are optional as your original settings will remain. You can now check out your mod in the Workshop. Since it’s currently hidden, you can do a final check and make any last minute changes or add any screenshots and videos to your Workshop page. It’s recommended to add as much info/details as possible of your mod as people are more likely to subscribe if it’s well done. Adding screenshots is important so people can see right away what your game looks like. You can also add any contributors* that helped you create the mod as well as add any of your social media links. And if you decide you no longer wish to update or have your mod public, you can either make it hidden or just delete it altogether. Once you’re ready to make it public, you can change the visibility either to friends only or to the general public. *Please note that contributors cannot update your mod for you. This is an ability that Valve needs to add, and at this time it’s not high on their list. Subscribing to a mod on the Workshop is very easy. You can sort by game type and number of players. This is why when creating a mod it’s very important to put the correct tag of your mod to make it easier for people to find the games they want on the Workshop. Once you find the mods you are interested in trying out, you can either click on the mod’s page to read through the description and subscribe there, or you can hover over each mod and click the green plus sign button. If you are already subscribed to it, it will have a checkmark underneath of the image. To unsubscribe, you do so the same way you subscribed however, the game will still show up in TTS, it just won’t be updated. To fully delete it from the game AND unsubscribe at the same time, you can easily do so in TTS by clicking on GAMES -> WORKSHOP, and search for the game you’d like to unsubscribe and hover over it. Click the 3 dots icon and choose delete. You will get a popup confirmation to ensure you want to delete this game. This will both unsubscribe you from the mod and delete it from your computer. If you find a mod you like, but you’d like to improve upon it for your own personal use, you can set it up with your own additions and just save it. 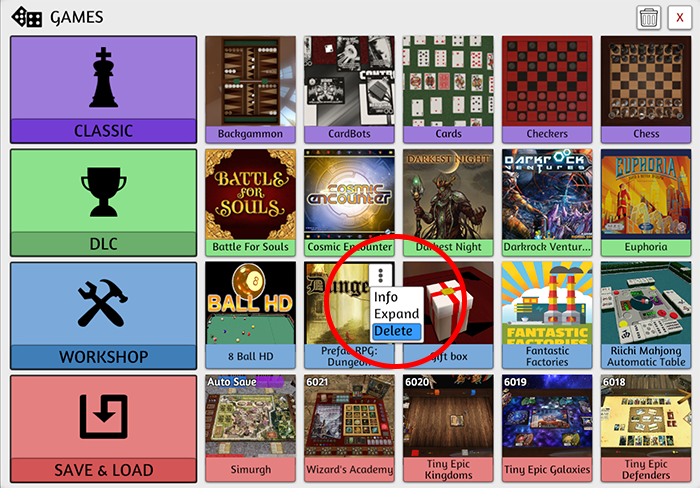 Click on GAMES -> SAVE & LOAD and choose the “Create” button on the top right. Then name it whatever you’d like. Please do not however, re-upload it to the Workshop and call it your own. You can read about saving and loading games here. If you just want a particular piece or two of the subscribed mod, you can right click on the object and click “Save Object”. You can either add it to a folder that’s already been created or just add it directly to your COMPONENTS menu. Just name it whatever you’d like. Now you can just add that particular object to whatever game you are playing without opening up the entire mod from the Workshop.